He said in a statement: "My dear mother has passed on at age 92. Laura, Barbara, Jenna, and I are sad, but our souls are settled because we know hers was. Barbara Bush was a fabulous First Lady and a woman unlike any other who brought levity, love, and literacy to millions." 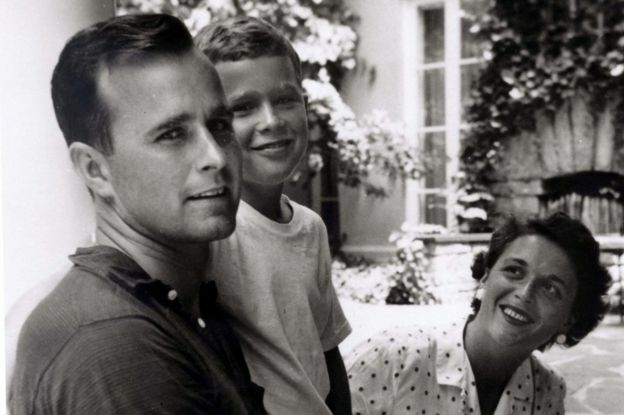 Mr Bush said his mother had "kept us on our toes and kept us laughing until the end", adding: "I'm a lucky man that Barbara Bush was my mother. Our family will miss her dearly, and we thank you all for your prayers and good wishes." A statement from the office of her husband described her as a "relentless proponent of family literacy". 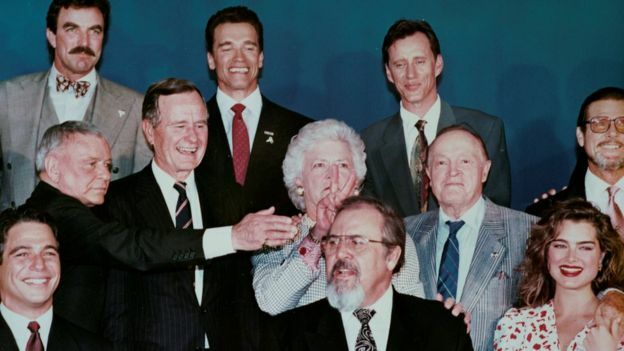 As first lady, Mrs Bush went beyond the traditional role of a political spouse, founding the Barbara Bush Foundation for Family Literacy to help parents and children from disadvantaged communities to read and write. 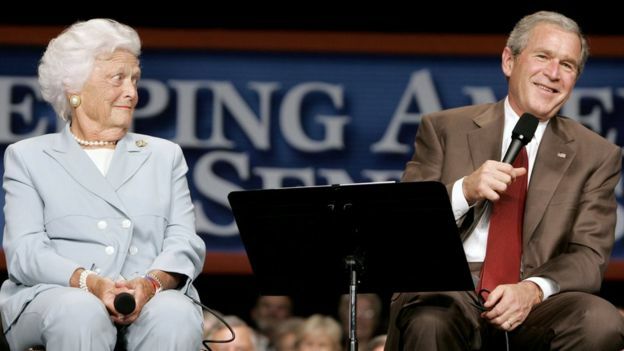 She was a fierce advocate of civil rights and went against many of her husband's Republican party supporters with her more liberal view on abortion rights. In a statement from the White House, President Donald Trump said Mrs Bush would be long remembered for her devotion to country and family, "both of which she served unfailingly well". Barack and Michelle Obama described her as "the rock of a family dedicated to public service" and as "an example of the humility and decency that reflects the very best of the American spirit". Another former US president, Bill Clinton, said Mrs Bush was "feisty in support of her family and friends, her country and her causes". He said he and Hillary Clinton would "never forget the courtesy she and President Bush showed us". 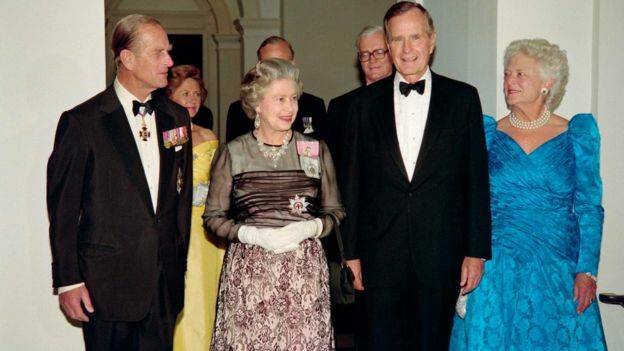 Mrs Bush was known for her snow-white hair and was dubbed "The Silver Fox" by her family. She once dismissed speculation that she had influenced her husband during his time in the White House, saying: "I don't fool around with his office and he doesn't fool around with my household." Mrs Bush also sparked a debate on gender equality in 1990 with an address to the all-women Wellesley College. She told graduates: "Who knows, somewhere out in this audience may even be someone who will one day follow in my footsteps and preside over the White House as the president's spouse and I wish him well." George HW Bush, who served as the 41st US president, suffers from a form of Parkinson's disease and useIt was recently announced that Mrs Bush had declined further medical treatment after a series of hospital visits, but the statement did not reveal the nature of her ailments. She said she wanted to spend her last days in "comfort care" with her family. Mrs Bush was born Barbara Pierce, the daughter of Marvin Pierce, publisher of McCall's magazine. She grew up in Rye, New York. She met her future husband in 1941 at a Christmas party in Connecticut and the couple celebrated their 73rd wedding anniversary in January this year. Mrs Bush was one of only two women whose husband and son became US president, and the only one to have seen them both sworn in. Abigail Adams was married to the second US president, John Adams, and was the mother of the sixth, John Quincy Adams, although she did not live to see their son elected.s a wheelchair.